Current president Ben Rivera got his start with the company on the shop floor and was the design and engineering driver behind Leatherman’s popular Micro and Wave lines. 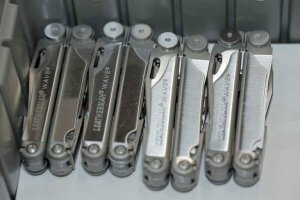 A row of Leatherman Wave multi-tools, the company’s current best-seller, ready for shipment. 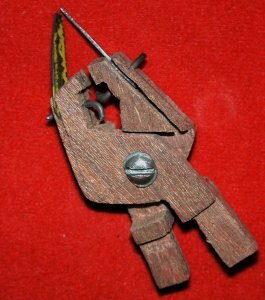 Actual wooden model/ prototype of what would eventually become the classic multi-tool that made the Leatherman a household name. Sometimes, a product line and its name are so perfectly matched that it seems like alchemy, or at the very least, destiny. When the product line is tagged to a founder, it has the potential to become iconic. Take “Harleys” for example. Bill Harley and Arthur Davidson probably never imagined their metal masters of the roadways would carve a big swath out of the American imagination with a single name: Harley. The same could easily be said for Tim Leatherman. Sparked by some traveling frustrations when he and his wife, Chau, were on a youthful, shoestring tour of Europe in the early 1970’s, the lightbulb of inspiration was clicked on. “That trip is the true origin story of this business,” says Leatherman. From leaky and cranky hotel faucets to the constant need for roadside fixes of a temperamental (is there any other kind?) old Fiat, Leatherman was limited in what he could accomplish with his handy scout knife. “I really needed a pair of pliers,” recalls Leatherman. Leatherman, an Oregon native with a Mechanical Engineering degree from Oregon State University, came back from that trip and poured his frustration into inspiration. Sketch after sketch and new idea after new idea, Leatherman eventually spent three years envisioning and ultimately building a prototype. His hand-held multi-tool was patented and originally dubbed “Mr. Crunch”. With prototype in hand, Leatherman beat the pavement looking for buyers. It was, to say the least, a hard sell. Leatherman struggled to find the right niche for his innovation for roughly another three years. 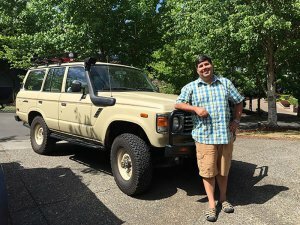 Eventually, enlisting the help of a college buddy, Steve Berliner, they caught a break when in the spring of 1983, outdoor gear mail order (now retail experience) giant Cabela’s placed an order for 500 tools. By that time, “Mr. Crunch” had given way to the Leatherman Pocket Survival Tool (PST), which quickly just became known by those in the know as “The Leatherman”. After a long incubation, a legend was born. That first product had all the hallmarks of Leatherman’s reputation as it has grown as a company: clever innovation and design, ease of use and a relentless commitment to quality materials. Eight years in the making, the PST comprised of 13 different tools folded up into a five-ounce, four-inch toolbox. In the first full year of business, Leatherman and Berliner had a goal of selling 4,000 tools. They sold 30,000. Today, the Leatherman line of innovative tools stretches to 44 products. Leatherman tools are sold in more than 120 companies. Leatherman holds approximately 55 percent of the marketplace, domestically, and employs more than 500 full-time employees from its Northeast Portland location. The company has also established itself as a great place to work, where great ideas are fostered and encouraged, and good talent is nurtured. Take, for example, the current company president. While Leatherman and Berliner as co-founders still remain active as senior board members, Ben Rivera is the company’s current president and he got his start on the shop floor as a manufacturing engineer back in 1991 and was elevated to his current post in 2013. “I seem to have followed a familiar path,” said Rivera. Rivera received his degree in Mechanical Engineering from Oregon State University (sound familiar?) and while he progressed in his role at Leatherman, he was routinely encouraged to offer design suggestions. It paid off, for Rivera and the company. Rivera was critical to the development of some of Leatherman’s most popular product lines: the Micro, its most popular Wave line and most recently, a wearable series of the tool known as the Tread. These developments were reasons Rivera was recognized by the FastCompany magazine as one of the “Most Creative People in Business” in 2015. The encouragement and commitment to employees manifests itself in a number of ways at Leatherman. The company was one of three Oregon businesses recognized nationally as one of the “100 Healthiest Workplaces” in the country for 2016. SAIF Corporation was another Oregon business that made the list. For years, SAIF Corporation has been directly assisting Leatherman in its efforts to keep its nearly 100,000-square foot manufacturing space the safest one possible, providing loss prevention and workplace safety support. Leatherman takes advantage of those services from SAIF while enjoying the additional benefits that come with being a member of the CompSAFE group workers’ compensation insurance program. As the company says: The three things you need to conquer your everyday: your know-how, your own two hands, and your Leatherman. After all, a tool is just a tool until you own it. Together, you’re prepared for anything. Bring it on, life.